A nice easy tee that can be made out of a woven fabric...sounds like a great idea to me! 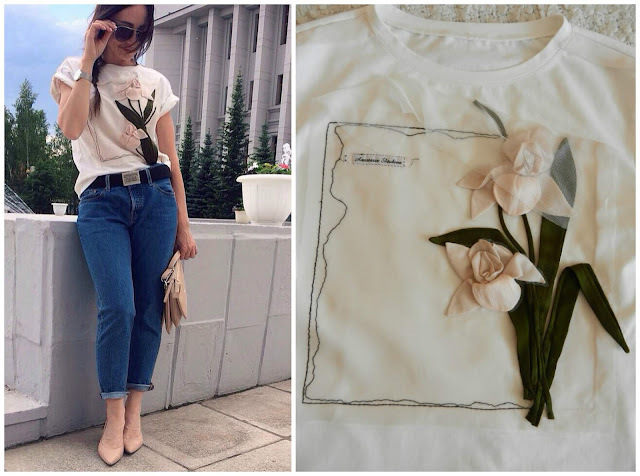 A few weeks back, Fabric-Store.com posted the raglan tee below. It's a nice clean design, so I thought I would give it a try. I had just a couple of issues with the pattern. 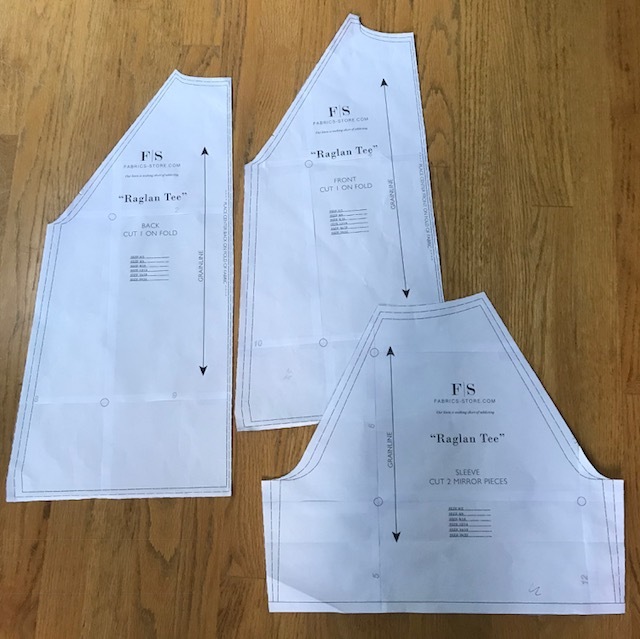 There are no sizes marked, and there are no notches, which can be confusing when it comes to attaching the sleeve to the front and back. Prior to cutting, I put my own notches on the raglan seams to mark front and back. Easy enough to do. 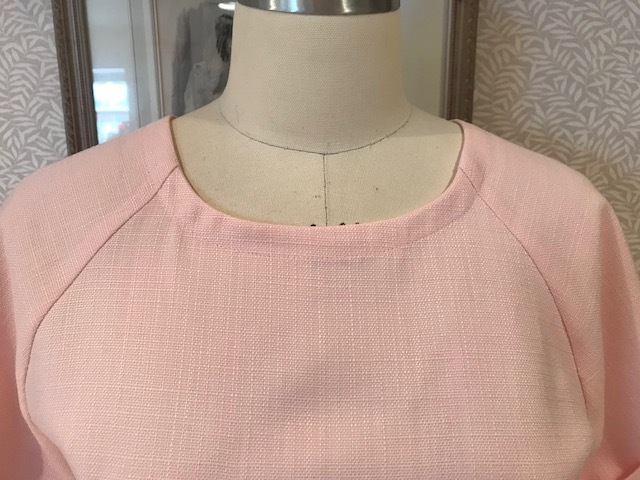 As for the sizing, just measure across the lower portion of the pattern and then decide based on your hip measurement which line to cut on. One other issue is that in the instructions, there is no seam allowance specified. I used 5/8". Other than those 3 issues, the pattern went together easily. I decided to give it a whirl with some fabric that I found as I was cleaning up the studio, a calico print that I had completely forgotten about. 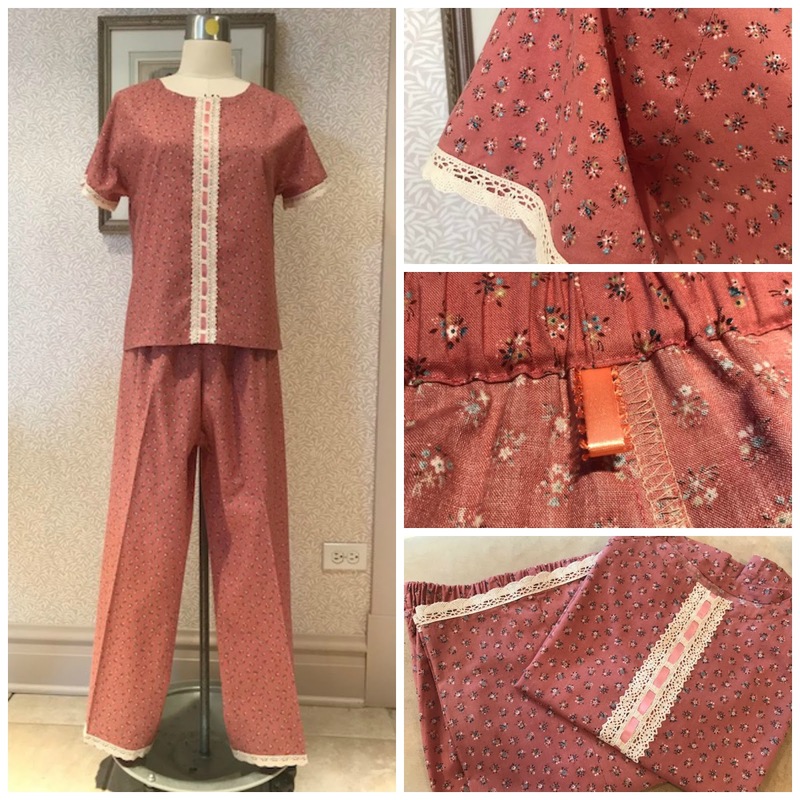 Thought it would make a nice pair of summer pajamas. The instructions call for 2 small tucks on either side of center in the front and back. When I made up the tee, the tucks were not needed. Look closely at the picture below and you can see that a small dart is needed on the shoulder. 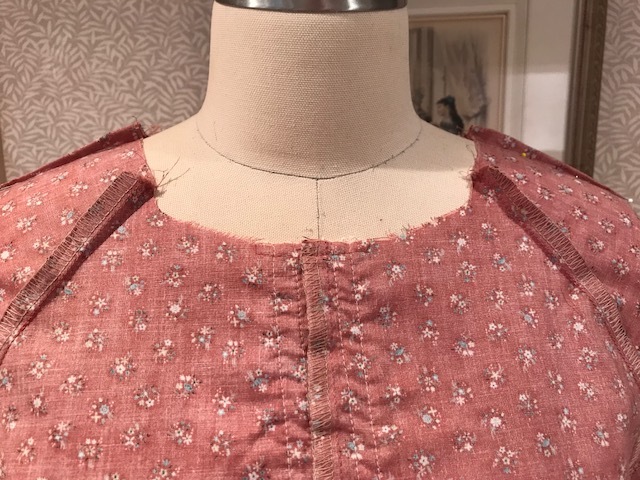 Once the dart was added on the shoulder, the garment laid flat and there was no need for front and back tucks. 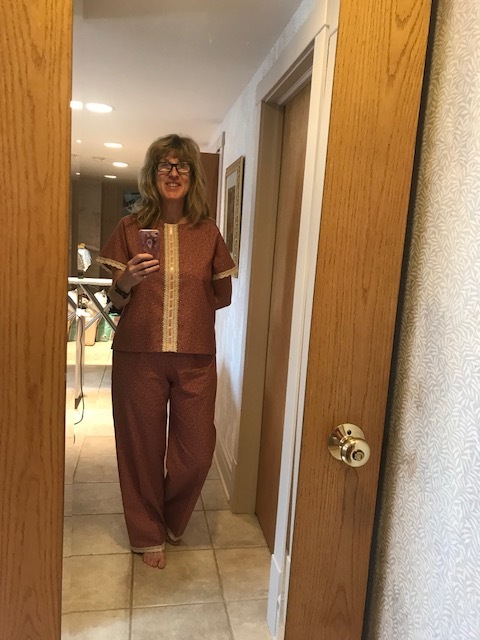 My finished pajamas. I had to cut the tee with a seam down the center of the back and front. I had the crocheted trim, so I threaded a piece of ribbon through, sewed it down the center and covered up the center front seam. I had another piece of crocheted trim that I added to the sleeves and the hem of the pants. 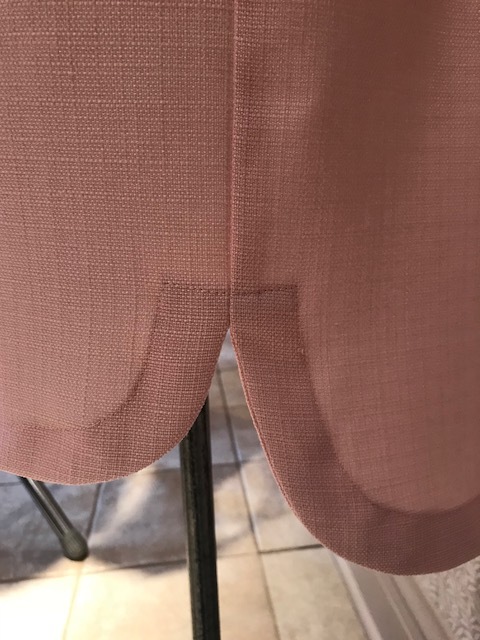 The center picture on the right below shows how I mark the back of my pants. Great use of bits of ribbon. I had a small piece of silk that was just enough for another top. This time I had enough to do the cuffs. I once again added a dart on the shoulder. 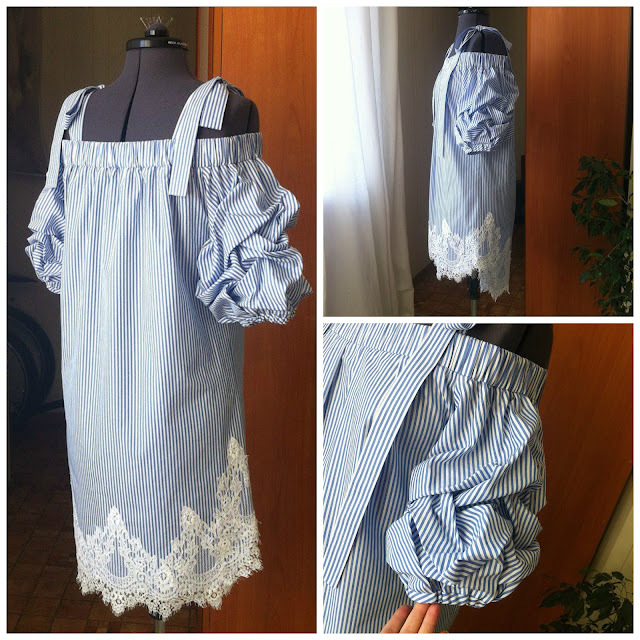 I really like how the top wears, so I decided to lengthen it and make a t-shirt dress. 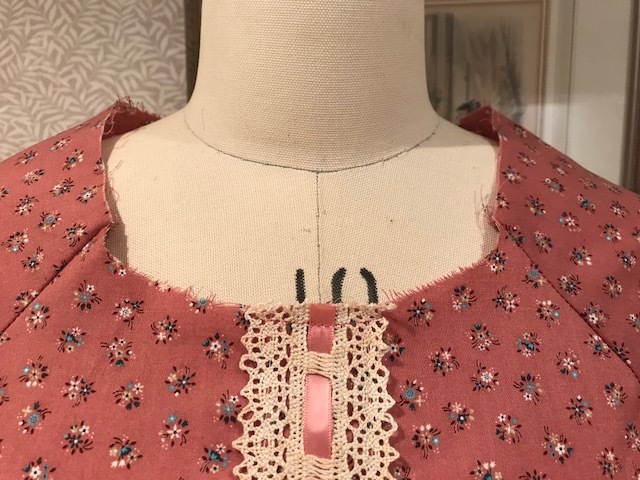 With this fabric, I did not need to add the shoulder darts as the neckline laid flat without them. I added a shirt tail hem. 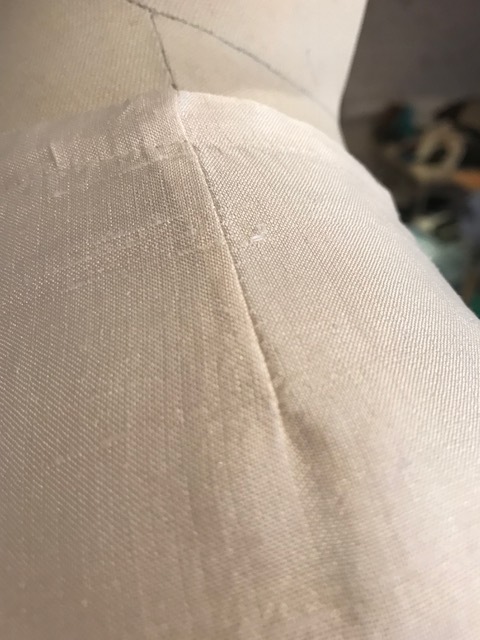 To finish the hem, I cut a 2" wide piece of bias. I made the back a little longer than the front. 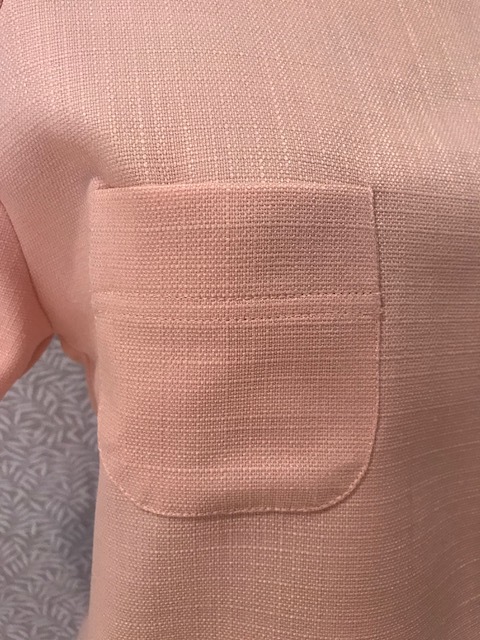 And finally, I added a small front pocket. It looks so cute on. I'll post pictures of me in the dress soon. The pajama pants as well as the striped pants are from a free pattern, the Martha Stewart pajama pant that I posted HERE. I find the pattern to be a great basic elastic waist pant. You can find the Raglan Tee pattern HERE. As many of you know, the past 9 months have been a bit of an odyssey for me. I am working on a piece that I plan to publish as an ebook that will tell the story. I had planned to have it ready by the 1st of June, but rather than make an excuse (eye surgery, etc. ), I'll just own up to the fact that I have drug my feet. Soon though. Like any odyssey though, along with the bad, there has been the good. 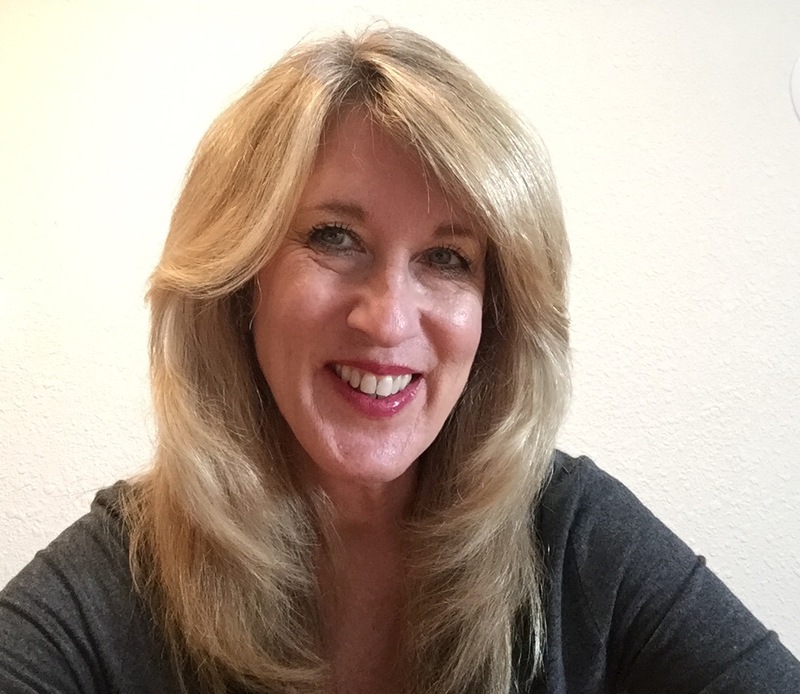 So often, we take a step, thinking we are heading in a certain direction, or maybe no direction at all, and then suddenly, something has happened that we never would have dreamed possible. A few weeks ago, I did a post on my Summer Bucket List. I shared how I decided to make my list special and paint a background. The piece is below. Once I had completed the picture, I thought that it might make a fun piece of fabric. The irony of it all has not been lost ;) Since I have put myself on a fabric purchasing diet until the 1st of August, I thought, "is this just my addiction finding a different way around getting what it wants?" Well...if it is...it won!!! I decided to go to the Spoonflower website and just see what would happen. Below is the outcome. I thought that if nothing more, I could use the piece as a tea towel. It's not perfect. 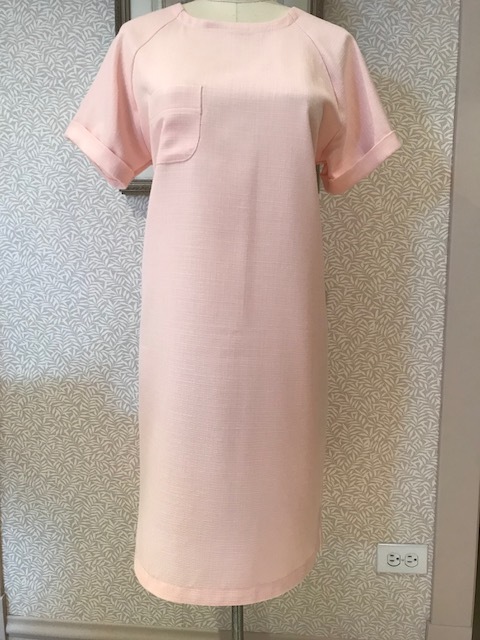 The design didn't work with the entire length of the fabric. Not a problem. When I pulled the fabric out of the bag, well, first of all, I was so excited as I loved it! My husband even exclaimed, "wow, that's beautiful!" 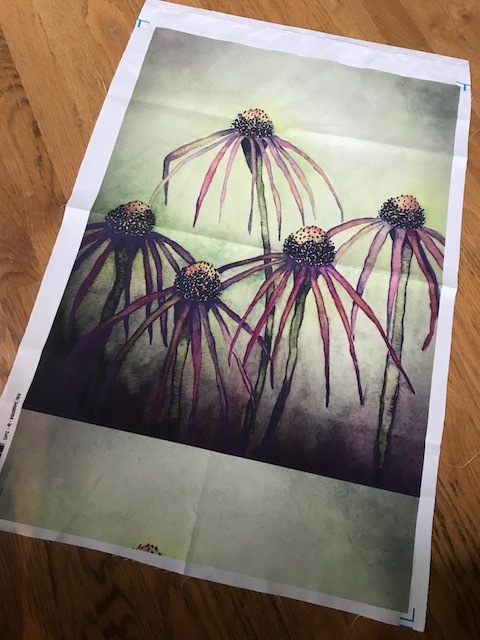 Nice :) When I saw the piece, I realized that the design is large enough for a bag, or a tea towel, so I will just cut off the incomplete repeat at the bottom. Maybe use it as a facing. 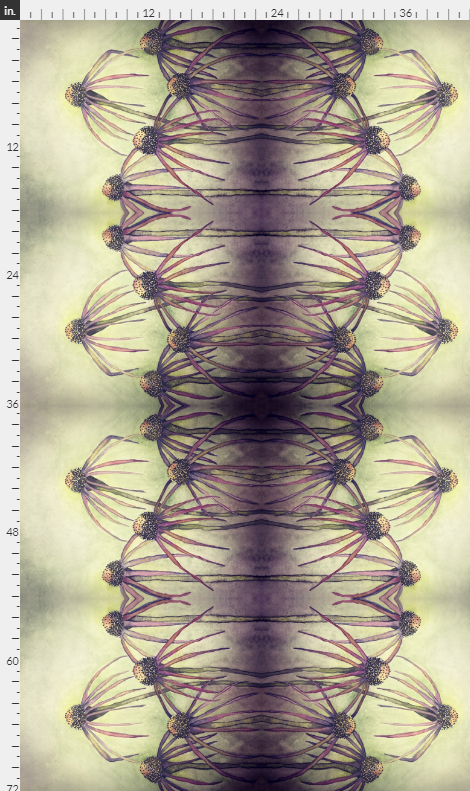 This morning, I went back to Spoonflower and did a little more playing around, and did the piece that you see below. I ordered 2 yards of cotton for a skirt. I cannot wait for it to arrive!!! Eight years ago, I NEVER would have imagined that I would create a piece of fabric with my own original artwork. NEVER!!! And here it is :) No, not Rembrandt, Picasso, or even Charles Schultz ;), but something I can be proud of. "A small rock holds back a great wave." 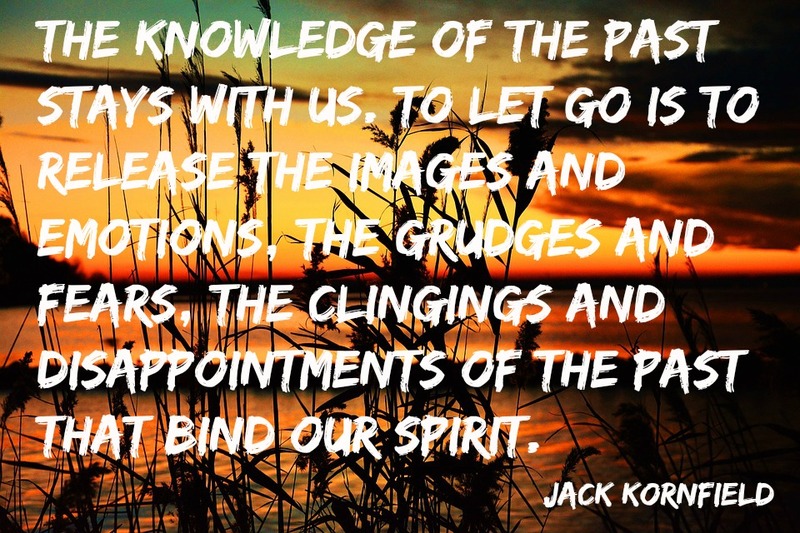 We've all had our "rocks" in life, the things that hold us back. On September 13, 2008, Hurricane Ike blew into Galveston, Texas. I was most amazed by how the water had been able to pick up boulders of granite and toss them onto the sea wall as thought they were made of styrofoam. Moral of the story..
As I was eating my breakfast this morning, I saw a few minutes of a design program featuring the newest, and hottest concepts in home design. 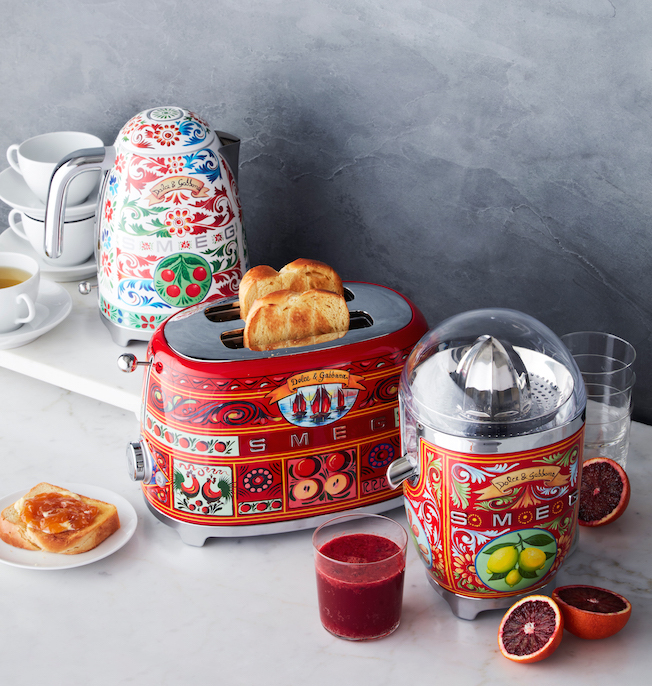 To my surprise, there was a segment on an Italian company called Smeg who has teamed up with, of all companies, Dolce and Gabbana to produce appliances for the kitchen. The first product that was produced were small refrigerators. 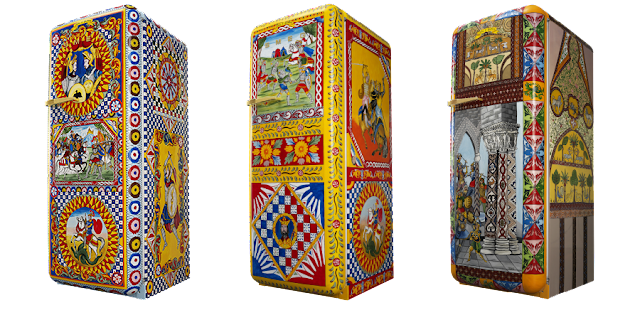 Each handpainted, and created by Sicilian artists. 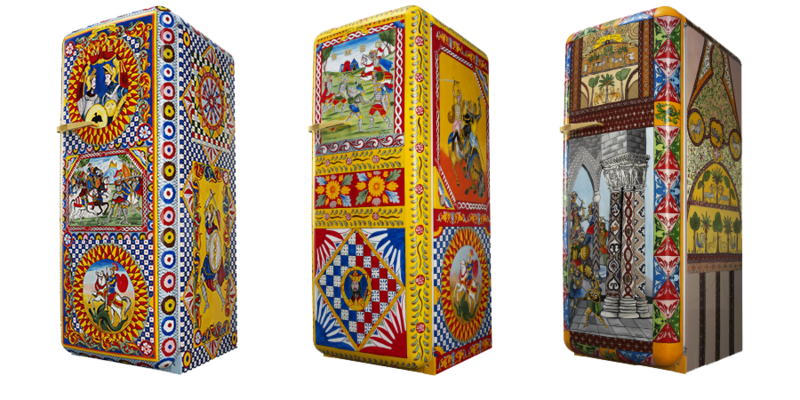 The artwork features cart wheels, medieval knights, and battle scenes. If by chance you are interested, the price of a refrigerator is $50,000! What I found rather interesting is that the clothes actually match the appliances! 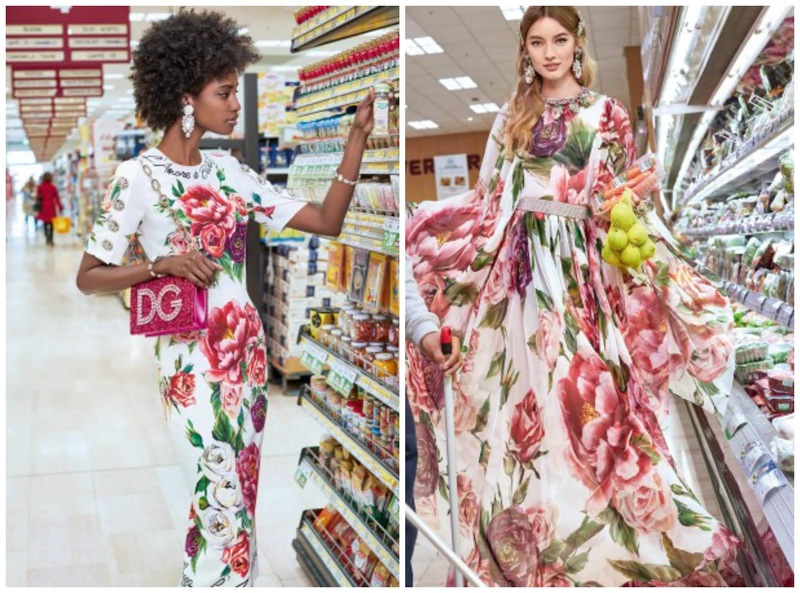 The pieces below were photographed in a supermarket. 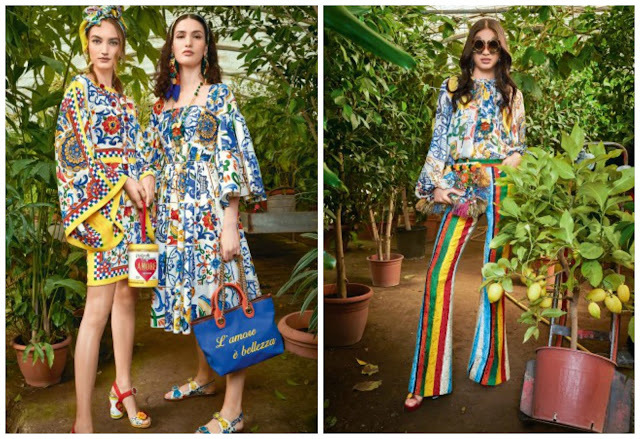 Of course we all shop in our Dolce and Gabbana garments!!! They are rather pretty, but not for the supermarket! I'm not quite sure how to sum all of this up. I guess that with the right branding, and the right customer, if you can dream it, you can sell it! 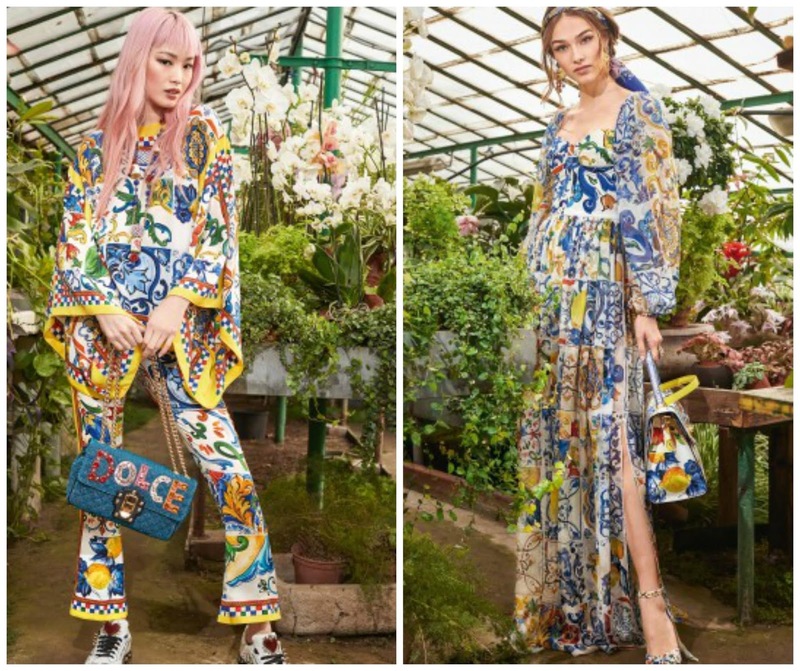 If you would like to explore more of the dolce and Gabbana world, check out their website. 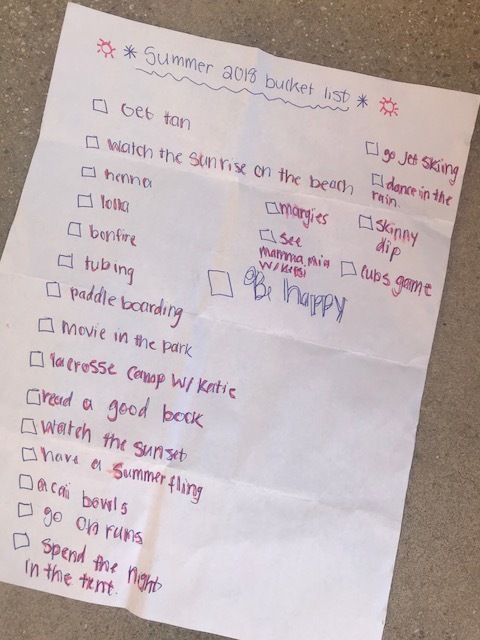 A few weeks back, I shared the summer bucket list that my husband found folded up and laying on the ground in an alley. He brought it home, thinking that I would enjoy seeing it, and I did :) I especially love the simplicity of the list. Everything is achievable within the course of the summer. I also loved the idea of being excited about the possibilities of the summer. When was the last time I was excited about the summer?!! 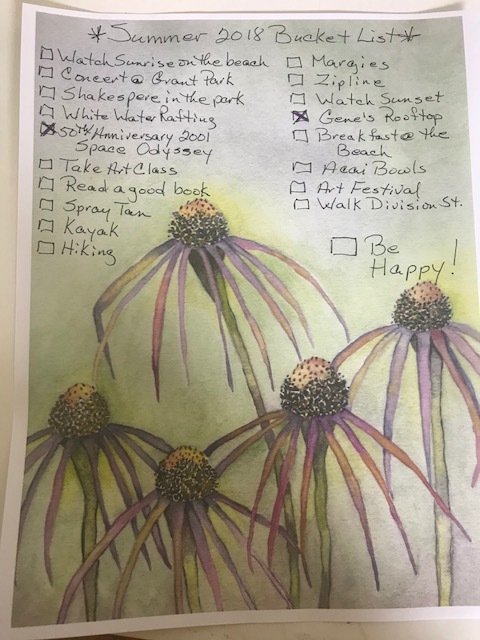 This simple little bucket list inspired me to do my own. You can find my original post HERE. I decided that my bucket list needed to be special, not just written out on a piece of typing paper. 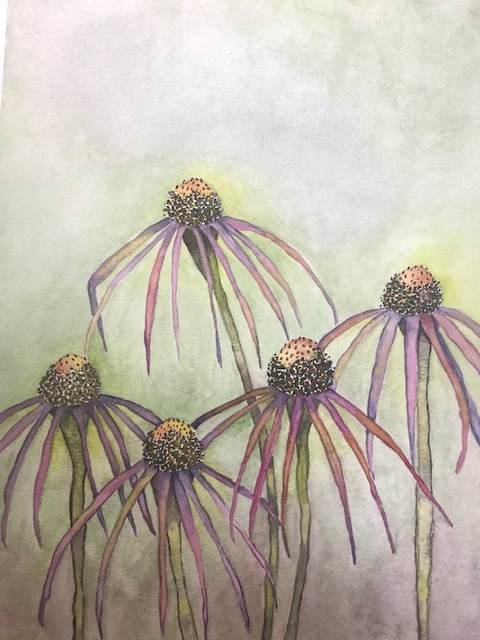 So, I sat down and painted the picture below. I did not write on my original painting, but rather copied it on to a piece of paper that I will mount on a piece of poster board. Below is my list. So far, 2 things have been checked off. I really wanted to see 2001: A Space Odyssey for the 50th anniversary. That kicked off my summer as we saw it on Memorial Day, for me, the official beginning of summer. We have a wonderful theater in Chicago called The Music Box where they play all sorts of international films and art films. It was there that we saw the movie. There's a great German delicatessen in Chicago called Gene's Sausage Shop and Delicatessen. When you walk through the door, you feel as though you have been transported to Germany. They have a rooftop beer and wine garden where I have wanted to eat since they opened, but have neglected to. It finally happened last Friday night. I loved it! As you can see, I've tweaked the list to my own liking, but all things that I would like to do, and if I didn't have the list to remind me, I just might let them slip. What a fun project this has been. 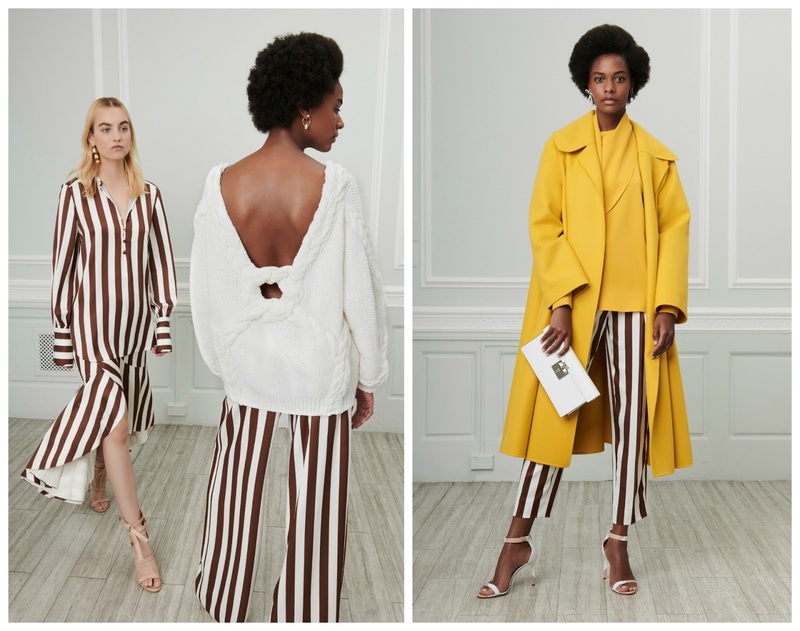 So much so that I am inspired to make a list for fall and winter. I recently came across the picture below. 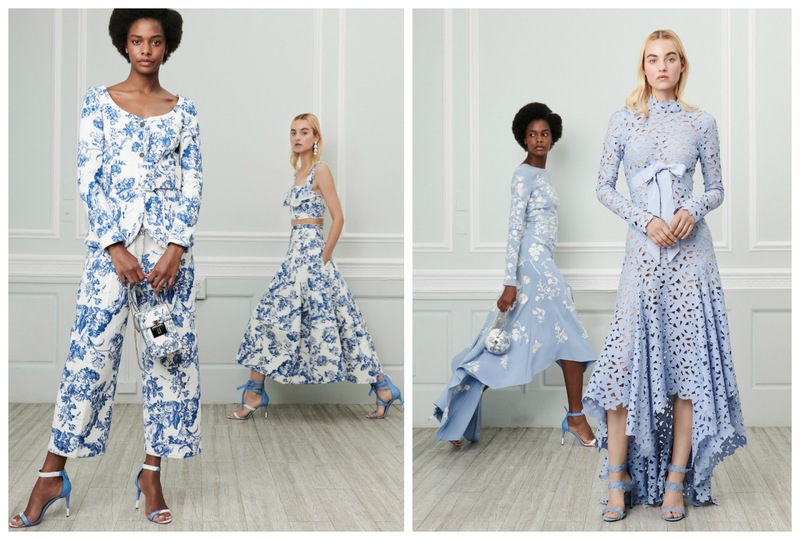 This lovely dress is from the Oscar de la Renta 2019 Resort collection. So many of the pieces are just fresh and fun. 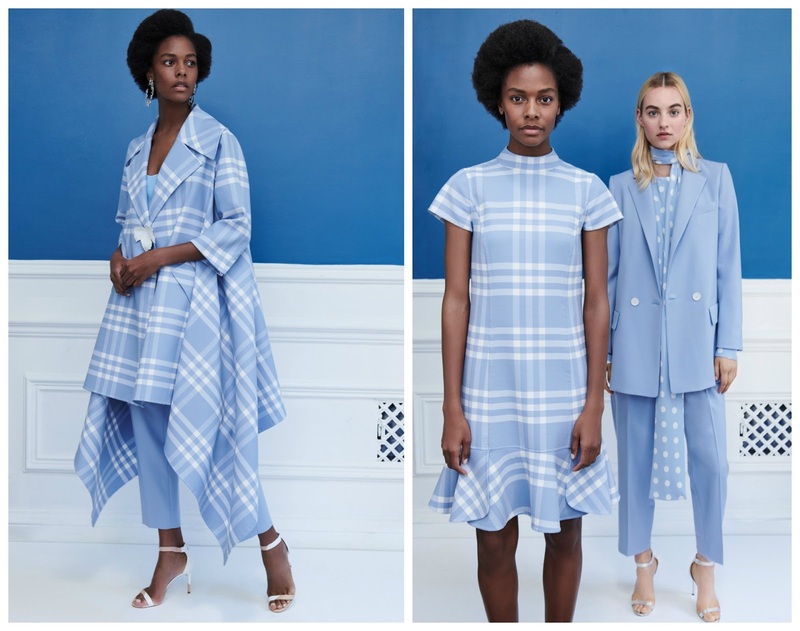 I especially love the plaid coat on the left below. And I found the brown stripes to be refreshing. The shorts on the left below are such fun with the contrasting pockets. I thought the short suit on the right was lovely too! 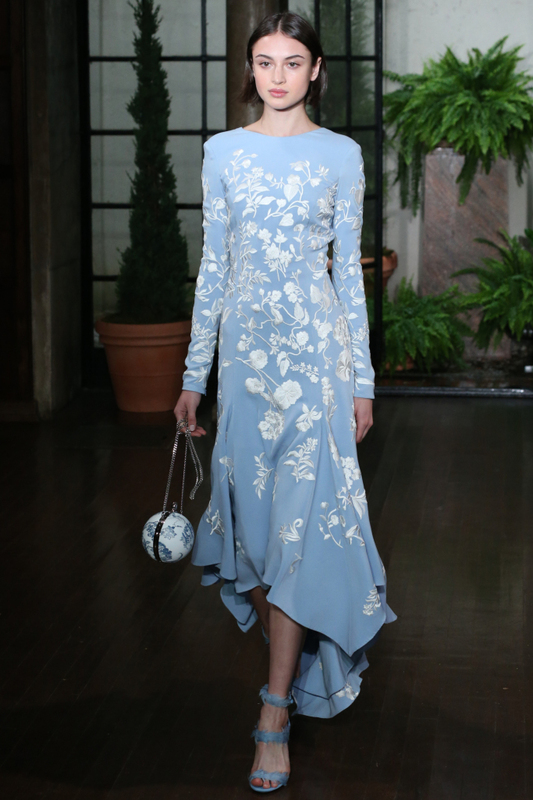 The design of the pieces is really nothing new, but I just love how pieces are paired. 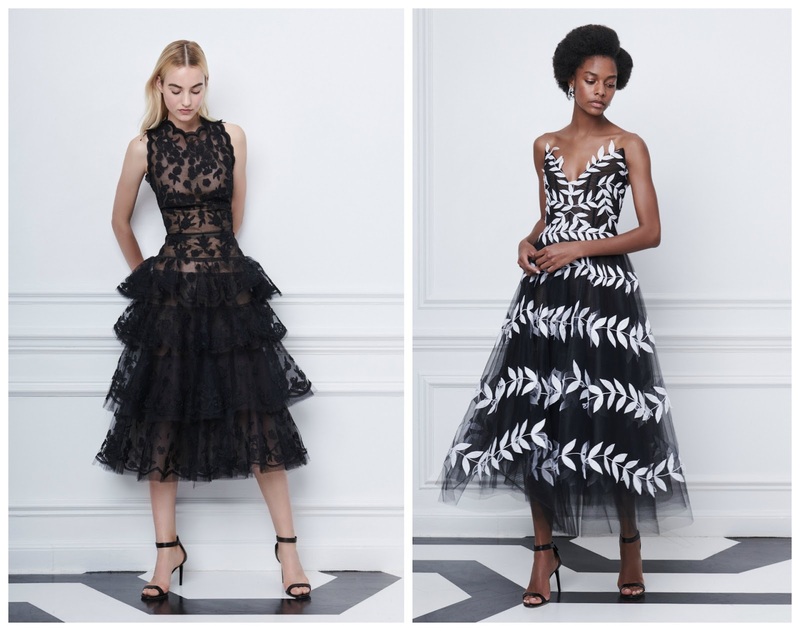 I thought both of the gowns below were especially pretty. You can see all of the collection HERE. I also put together the piece below that can be printed off if you like. Just a nice reminder to write down our dreams to make them a reality. Having a 'coke' was a treat when I was growing up, not something we drank on a daily basis. My fondest memories of drinking a soft drink were after our weekly afternoon of swimming. We were treated to the soft drink of our choice, and a bag of chips. I feel like a stone-age leftover saying this, but when I was growing up, chips did not come in the humongous bags that they do now. What we ate would be considered a very small bag by today's standards. But, after an afternoon of swimming, a soft drink and a bag of chips was such a treat. Truth be told, I still enjoy a soft drink from time to time. Yes, I know all about the bad things in a soft drink. I feel this way, everything in moderation. 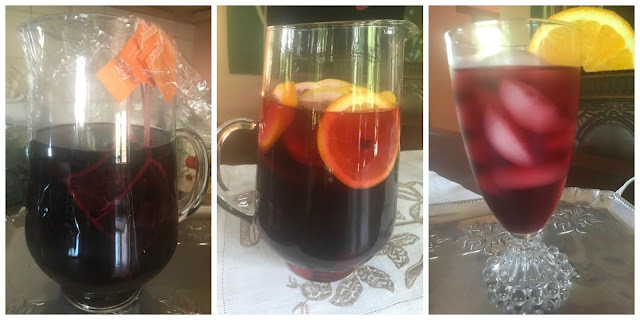 But, my go to drink in the summer time is a refreshing drink made with hibiscus tea. The natural red color of the blossoms is so inviting. 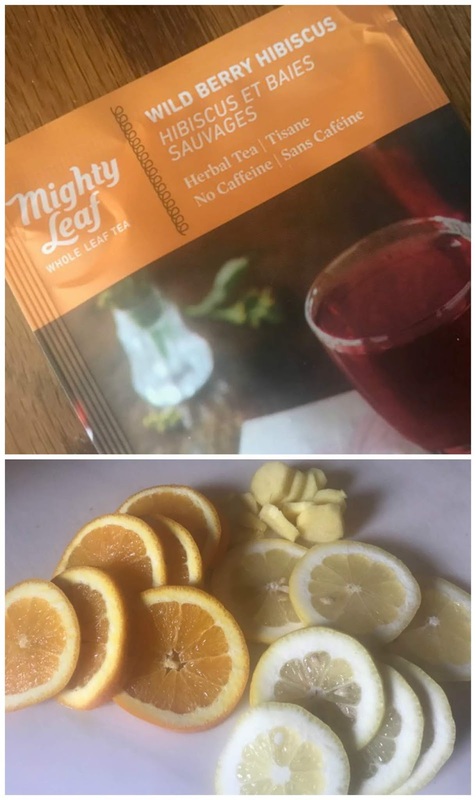 I really like Mighty Leaf teas, and order the teas I drink directly from the company. You can find their site HERE. Sign up for emails as they have some wonderful specials, like putting their teas on sale for half off. I brew the tea in a pitcher, usually 6 tea bags. I allow the tea to brew for at least 30 minutes. Once brewed, remove the teabags and allow the tea to cool. Once cooled, I add 1 orange sliced, 1 lemon sliced, and about 2" of fresh peeled and sliced ginger. Store in the refrigerator overnight to allow the juice to infuse the tea. If you would like to sweeten the tea, add stevia to taste. Serve in a pretty glass. Garnish with a slice of orange,and enjoy. If you would like some bubbles, add club soda, or sparkling water. For parties, mix the tea with some Prosecco for a refreshing cocktail. I can go through an entire pitcher during the course of the day, and to be honest, the thought of a soft drink never crosses my mind. 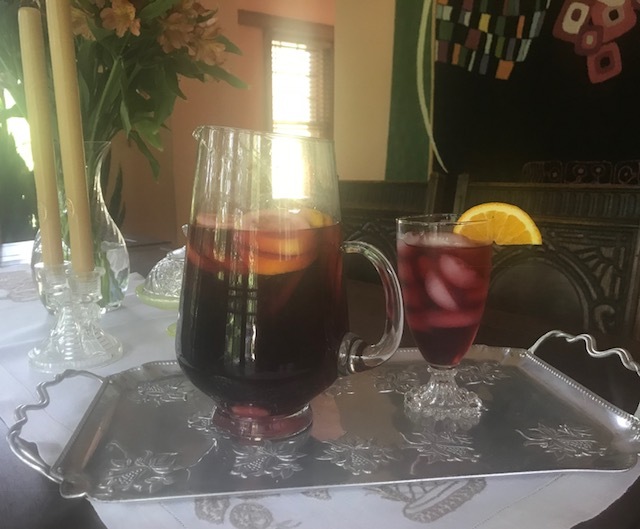 So if you would like to try and cut down on your soft drink consumption, give my Hibiscus Tea recipe a try. I think you'll love it! 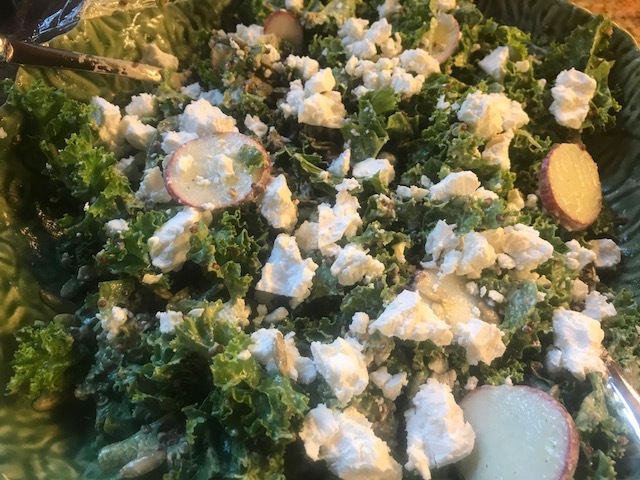 I have been planning to share this salad with you for the last few weeks. If I say so myself, it is OMG good! Begin by roasting 2 poblano peppers. It can be done in the oven with the broiler, or outside on a grill. Roast until blackened. Once roasted, place the peppers in a plastic bag for 15 minutes to steam. Remove and pull off the blackened skin, and seeds. 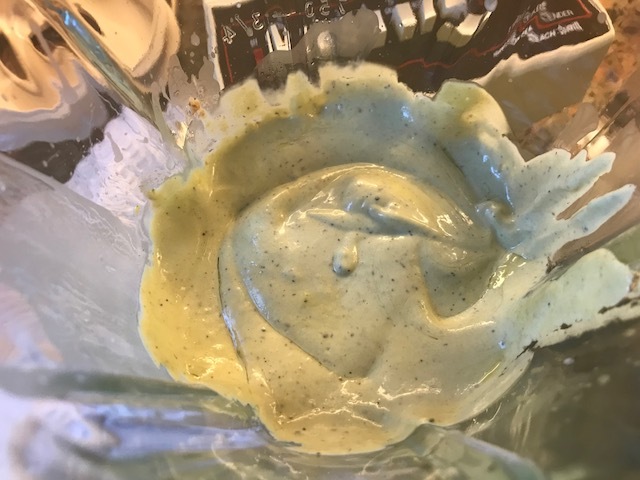 Place the skinned peppers in a blender along with 1/2 an avocado, 1 clove of garlic, 1 egg yolk, Dijon mustard, buttermilk, lemon juice, salt, black pepper, and olive oil. Blend to form a green cloud of deliciousness. Chop or tear up 4 cups of kale and place in a salad bowl. 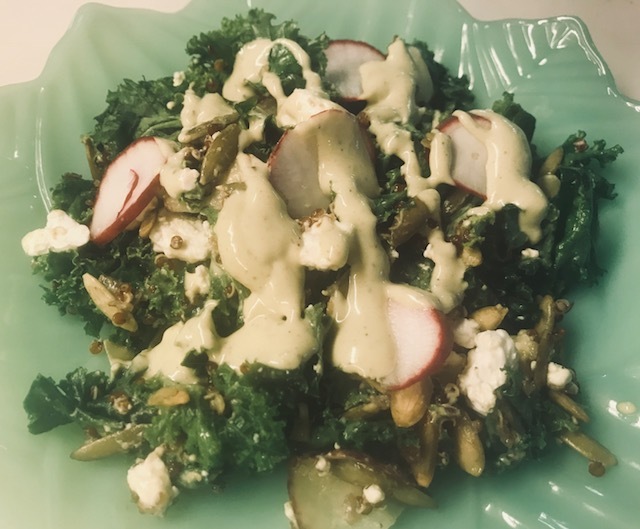 Top the kale with 4 sliced radishes, 1/2 cup of cooked red quinoa, and 1/2 cup of pumpkin seeds. This can be done ahead of time and kept in the refrigerator for a few hours until ready to serve. Pour 1/3 of the salad dressing over the salad, and mix well. Top the salad with 1/2 cup of crumbled feta cheese, and mix into the salad. Serve the salad with extra dressing on the side. Believe me, it's so good, you'll want to add a little more. A friend of mine said that she could eat the dressing like soup! Since kale holds up in the refrigerator, the leftovers are wonderful the following day for lunch. Roast poblano peppers in the broiler or on the grill until skin is blackened, about 10 minutes. Place in plastic bag and allow to steam for 15 minutes. 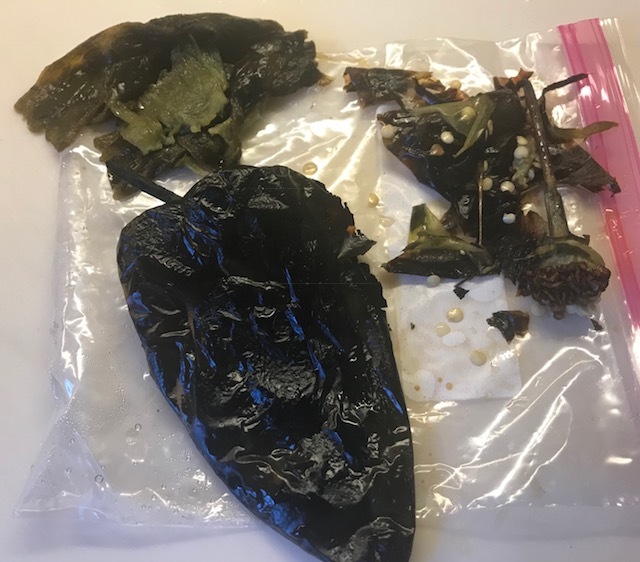 Remove from bag, remove blackened skin and seeds. Place in blender along with egg yolk, garlic, mustard, buttermilk, lemon juice, salt, and black pepper. Blend. While blender is running, slowly pour in the olive oil. If a thinner consistency is desired, add more buttermilk. 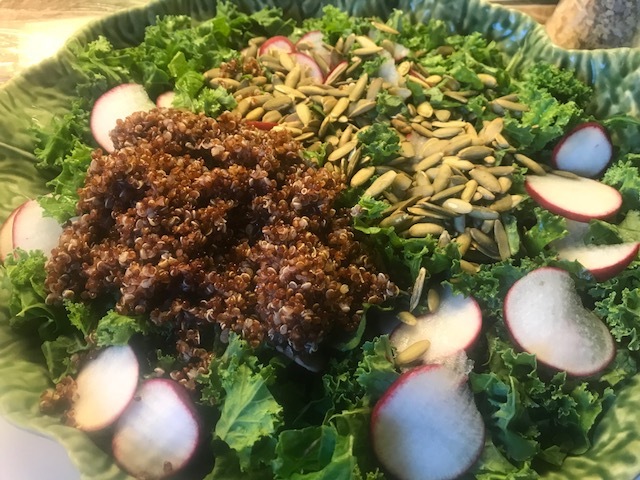 Place kale, radishes, red quinoa, and pumpkin seeds in a large salad bowl. Pour 1/3rd of the dressing over the salad, and toss well to mix. Top with the feta cheese, toss once again, and serve. The leftover dressing will last refrigerated for at least 3 days. It's good as a dip for carrot and celery sticks, too! Below is my work in progress. The shoe that you see at the top of the photo was my inspiration piece. 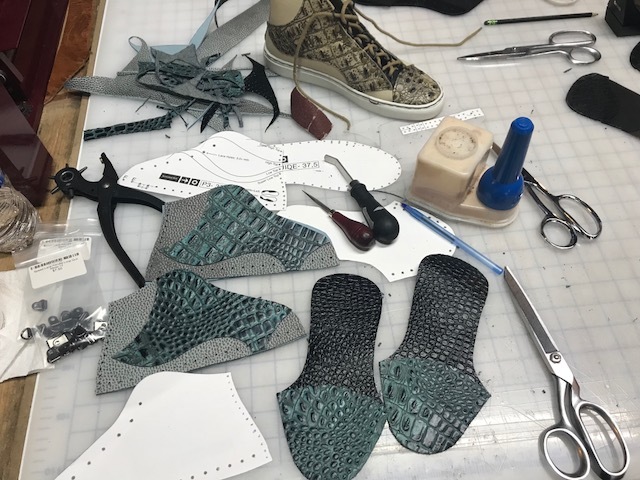 Below the shoe, you see my pattern, tools, and my shoe in pieces. The class was 2 full days of instruction. I made a mistake on one of my shoes while attaching the top of my shoe to the sole. At that point in the day, I was quite tired, and ready for a break, so I elected to just finish my shoe at home. 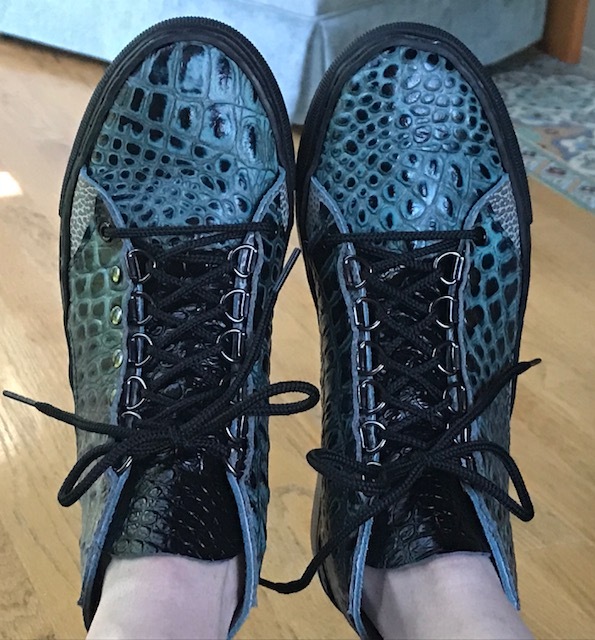 Last Sunday I finally sat down, redid the stitching, finished the shoe, and ordered my laces. Ta Daa!!! My finished sneakers. I love them!!! 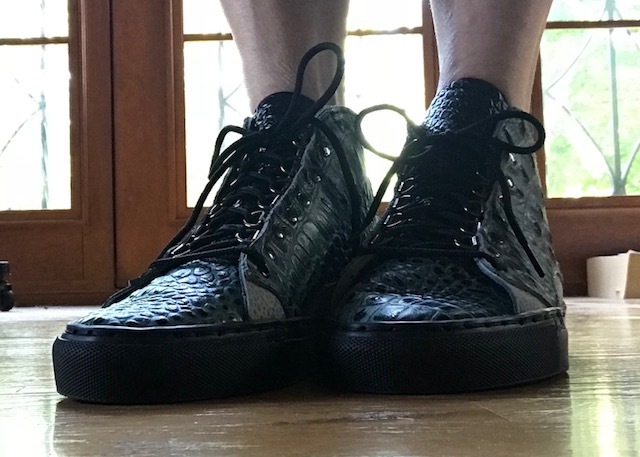 I have never been a big sneaker person, but these are not typical sneakers. Thankfully, my husband and I don't wear the same size shoe, or I would lose these! Here's to realizing our dreams! "He never said anything about what he did for me. Most guys when they mentor a young player like that, they go around saying, 'Yeah, that was me. I did that.' Not Moses. He never told anybody. And that was the best part." When I began cleaning up, and cleaning out my sewing studio, I cried to myself, "I can never buy another piece of fabric for as long as I live!!!" Then, I thought about the Barkley/Malone story, and realized that I was setting myself up for failure. So, I made a smaller, more obtainable goal, no new fabric shopping until August 1st. That was a 3 month goal, and one that I felt I could do. So far, so good :) But...whew!, in the last week or so, I have REALLY wanted to go to a fabric store. What helps a lot, is going into my studio and cleaning up a space, or a drawer. That's enough of a reminder, and the bonus is that I get excited about something that I want to make. I did another little exercise that was rather difficult. I went through my fabric, pulled out 5 pieces that I love, and put them in a bag. A friend of mine and I had made a date for tea. I took the bag with me, handed it to her and told her that she could have all, some, or none, it was her choice. I then explained that these were pieces that I love, so not castoffs. She took all but 1 piece. As I sat there and watched her go through the fabric, I'll be honest, I thought of all the wonderful things I could do with it, but I held tight. A day later, she sent me a picture of a fun shirt she had made to wear with tights, using a piece of the fabric that I had given her. I could not have been happier! She was happy, I was happy, and it was all because I let go. I then decided to take my exercise a step further. 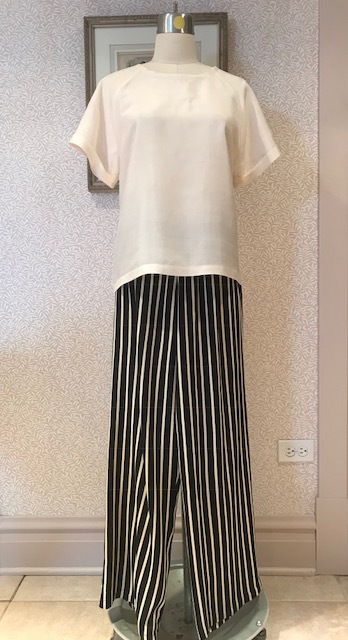 I invited another friend to come by, go through my fabric and choose a few pieces that she would like to have and felt she could use. As I sat there and watched her touch the fabric, I cringed a bit, but once again, I held tight, and let her choose what she wanted. And guess what?! !, as much as I cringed, I can't remember exactly which pieces she took!!! And even better, she left excited about her new projects. My fabric diet is not music to any fabric shop owner's ears, but it is a journey that I am happy that I have embarked upon. At this point, I am learning to let go, and use what I have. I thought I would begin the week with a lovely picture. A few weeks ago, my husband and I had walked to a restaurant in our neighborhood to have dinner. 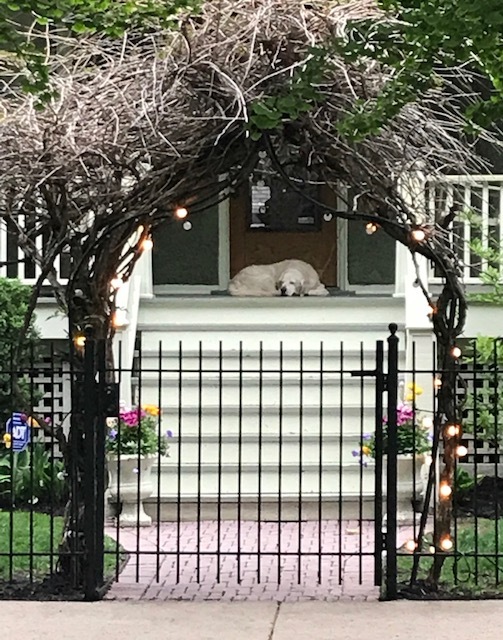 On our way home, we encountered this dog sleeping blissfully on his front porch. Talk about the epitome of peace and tranquility. 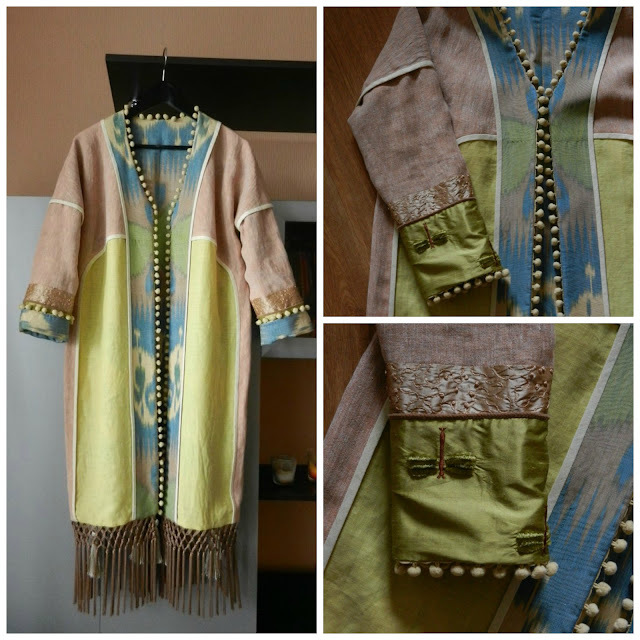 Just about a month ago, I did a Monday Morning Inspiration post on embellishment. I included the picture below and asked if anyone knew who created this magnificent piece. 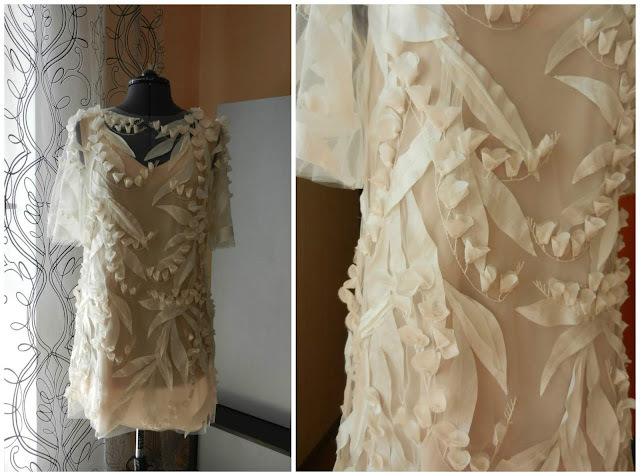 Elina sent a note and said that it belongs to an incredible Russian designer/seamstress by the name of Anastasia Shtubina. Elina also included links to Anastasia's blog and Instagram page. As I scrolled through Anastasia's work, I was blown away by her creativity and attention to detail. The coat below is such a lovely mix of fabrics and trims. She even added the embroidery detail to the cuffs. So amazing! 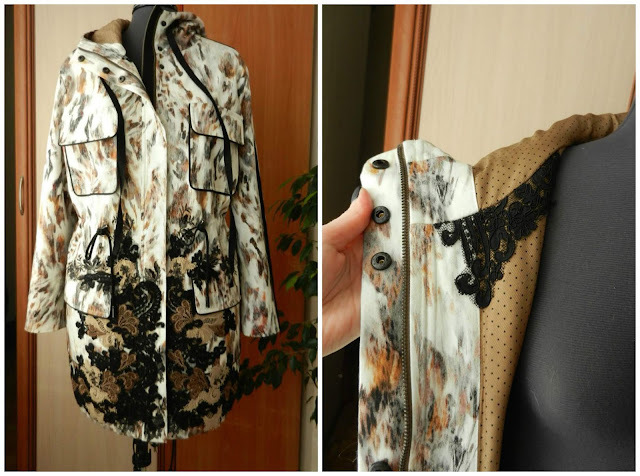 I love how she added the lace detail to this jacket, and even carried it into the inside neckline. 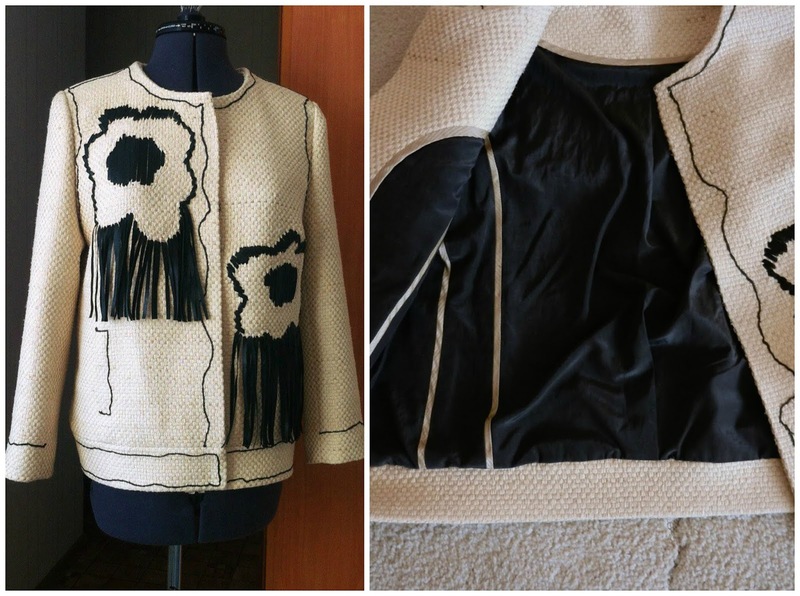 Here she embroidered the flower detail on to the jacket. Her attention to detail even travels to the inside of the jacket with the finished seams. Below, she took the same iris detail that she used on the coat, but did it in color and transformed a basic t-shirt into a truly couture piece. Talk about over the top gorgeous!!! The detail on this sheath is simply breathtaking. 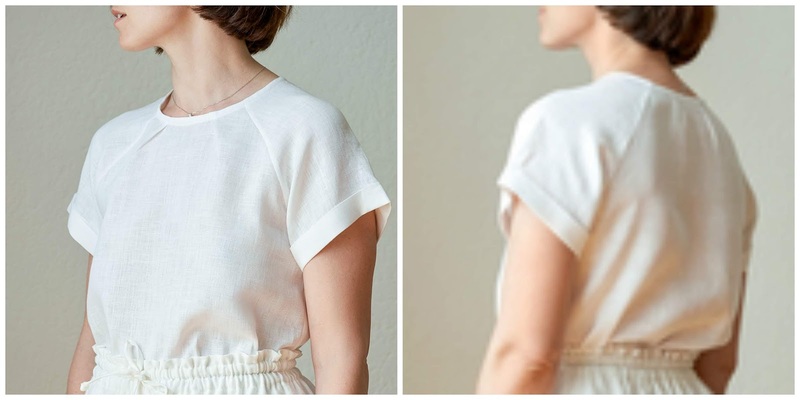 The lace trim along the hem of this top is lovely, but the added smocking on the sleeves makes it fresh and fun. Be sure to take a look at Anastasia's Instagram page, and follow her as well. There are so many lovely pieces there...so many. Her work is a prime example of what can be happen when we slow down a bit, and rather than just sew up a garment, we take the time to create.You can find Anastais's blog HERE.